Medicated Follower of Fashion: Maxi temp? Maxi dress! It's quite hot at the moment... up to 30 degrees which is pretty hot for these parts and we are also experiencing a wonderful (errr.. not!) 99% humidity so it is NOT COMFORTABLE! It's so hard to know what to wear when it's like this. Short skirts and shorts are great to a degree, but separates tend to get on my nerves a bit when I'm hot and sweaty. I feel like I'm being wrapped to tightly. What I tend to go for is a floaty maxi dress. Yes, it does mean more of you is covered, but you get a nice breeze around your (no! don't be dirty!) legs and if you like you can hitch it up a bit when you walk with your hand.. I do tend to do this!! 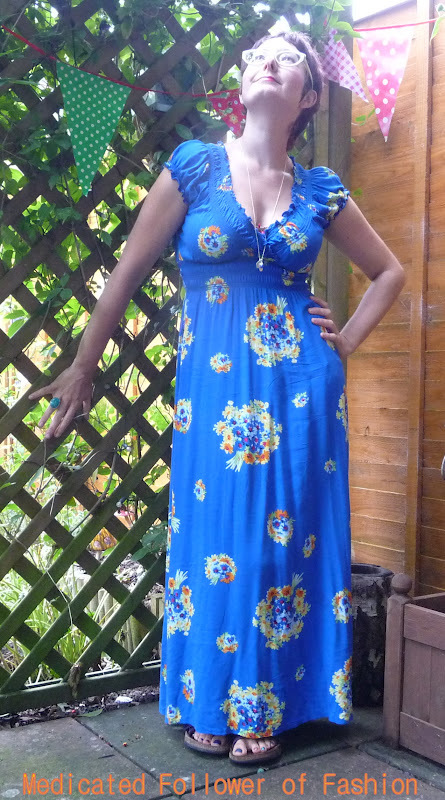 I have a few maxi dresses, but this is my favourite in hot weather because it's cotton, so doesn't add to the sweat! It's comfy, flattering and I don't have to wear a vest underneath because it doesn't cut too low - another bonus in the heat! Child photo bomber strikes again.. If I could change one thing about it, I'd like it to be longer. I'm not tall. I'm not even 5"2, but even still, it skims my ankles. This makes shoes a bit of an issue. I find even my Birkenstocks don't look right with it. They are the best I have, but I think it'd look better with some delicate flip flops or really flat sandals. I'll have to look out for something. The trouble is I need comfortable footwear because I do a lot of walking. When I've bought flipflops or thin sandals before they've either rubbed or broken really quickly. Any suggestions? 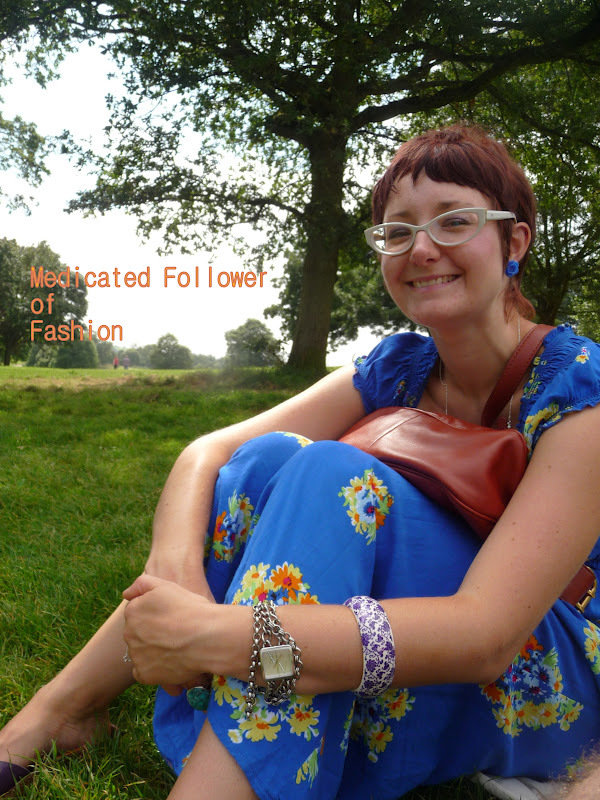 At first I added a scarf around my neck, but I was being silly, it was far too hot, so I kept it simple and just accessorised with jewellery. What are you wearing in this heat? Got any recommendations for dressing to stay cool? 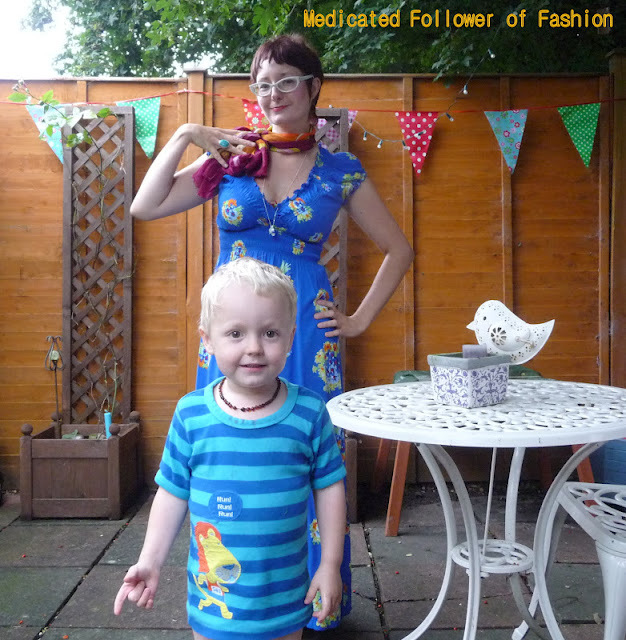 Linking up with Not Dead Yet, Monday Mingle,Watch What I'm Wearing & YOLO Mondays. I love the dress, and I would wear any shoes you find comfortable! What a great color on you and a perfect dress for heat!! You look so cute! Hi, I just saw your link up at Patti's and thought I would pop over to say hello! I love that dress, it's a beautiful colour and such a flattering neckline. I'm a sucker for a maxi too, perfect for keeping cool in summer but great for layering and keeping warm in the winter. So versatile and yet so stylish! 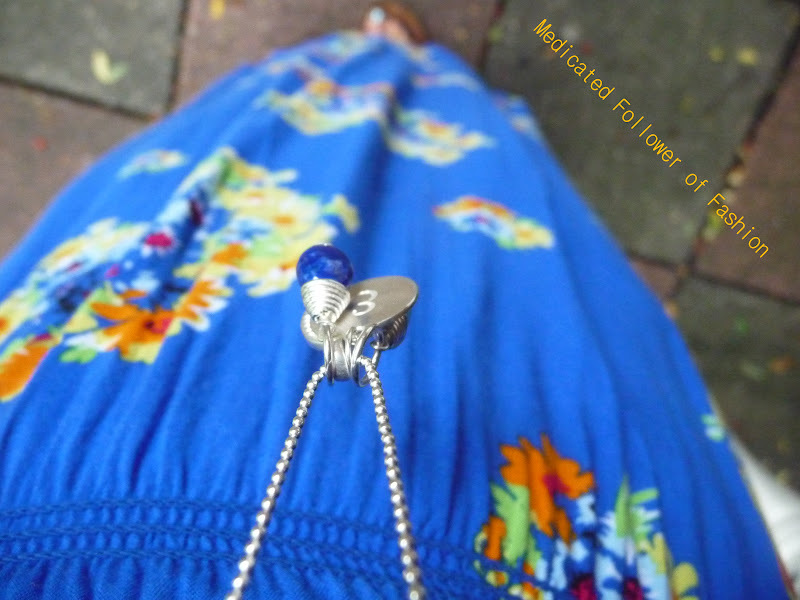 Thanks for linking up to Visible Monday and try to stay cool! How fun! What a great color, and a GREAT print! I'm with you on the maxi dresses for this heat. But I have a hard time finding them long enough and I do love the long length. This one looks perfect on you and I love the touches of your styling. Like those funky glasses and modern haircut. You are just cute as a button and the blue of that dress is great! My kind of color. Clarks shoes are pretty comfy... check them out. I wear Clarks sandals. I am doing the maxi dress thing too! As to sandals, I love my Think! Julia sandals. They are expensive, but considering the amount of wear they have gotten over several years, not to mention the comfort, they are worth every penny! The cork sole molds to your foot and feels amazing. 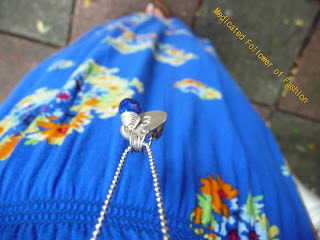 Your dress and accessories are just perfect for a hot summer day and you look lovely in them. Great maxi and the color is perfect for you! Your son is just adorable!